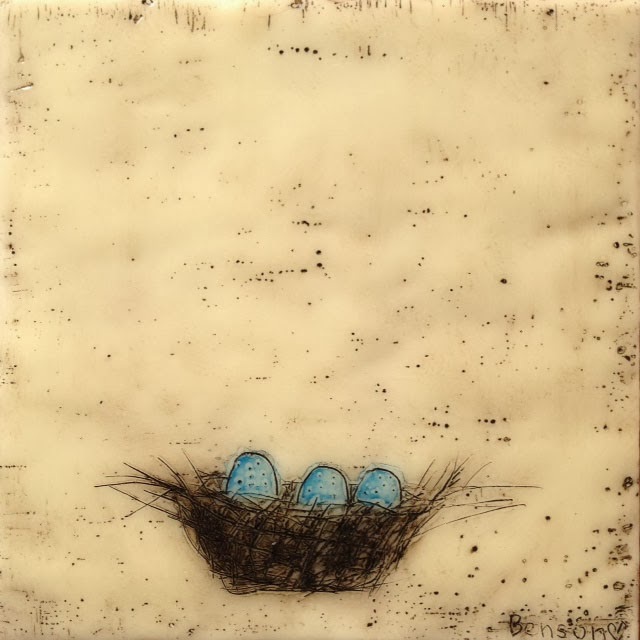 North Carolina artist, Jessie Benson creates encaustic work that encompasses not just her love of many art mediums, but also her deep respect and passion for nature. She finds constant inspiration in the trees, leaves and birds around her. “Birds are a favorite subject matter as well and I am fortunate to have a yard full of birds of many species. They are constantly inspiring me,” she explains. “I love to paint trees, birds, nests, flowers, really any part of nature I find beautiful.” However, Jessie also likes the challenge of commissions, because the subjects aren’t normally what she would choose, such as a recent ship triptych. 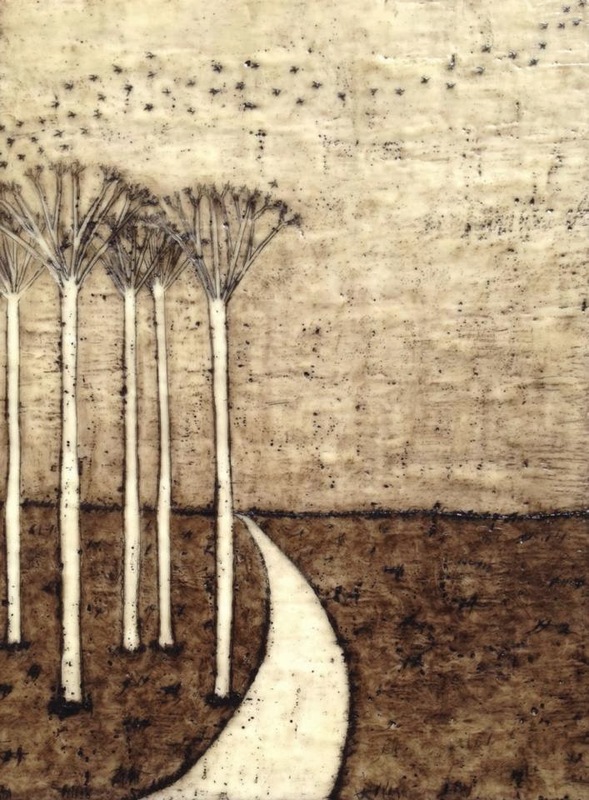 Jessie has new work opening tonight at the Visual Art Exchange’s MOVE show including her favorite painting ‘Becoming The Moon.’ Come out to the opening reception with Raleigh’s First Friday events March 7 from 6-9 pm 309 W. Martin St. downtown Raleigh, NC. 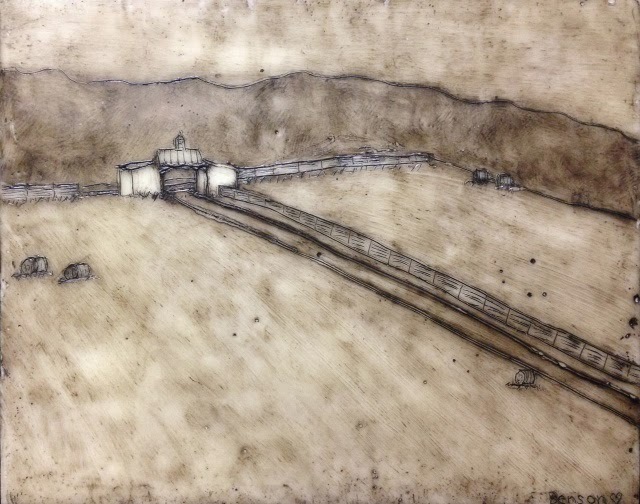 Next week, Jessie will be in Woodstock, Illinois for the 27th Annual Women’s Works Show to display her work Faith, opening on March 13thTo see more of Jessie’s encaustic work, or her other art, tune in to her website at: starfruitworks.com. As an extension of Jessie’s love of nature, she gives a portion of her proceeds to the North Carolina nonprofit Center or Human-Earth Restoration that serves to reconnect adults and children with the natural world.